26.3 by 17.8 cm., 10 ½ by 7 ¼ in. The Birmingham exhibition catalogue of 1890 describes this watercolour as `Painted in the Coffee Room of an Inn at Lancaster in 1840'. `Commercial traveller` was the nineteenth century term for a travelling salesman. 26.4 by 36.7 cm., 10 ¼ by 14 ½ in. 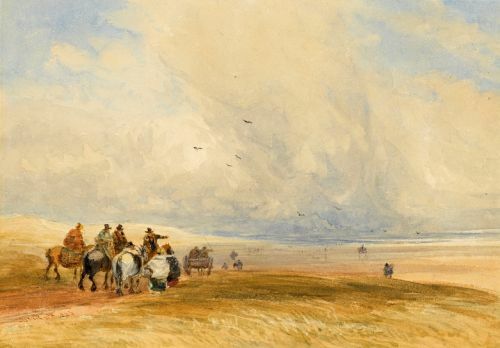 This atmospheric watercolour, dated 1856, is an exceptional example of Cox’s late style, reminiscent of his famous Welsh Funeral watercolours drawn at Bettws-y-Coed in North Wales. Cox drew the churchyard at Darley Dale a number of times. 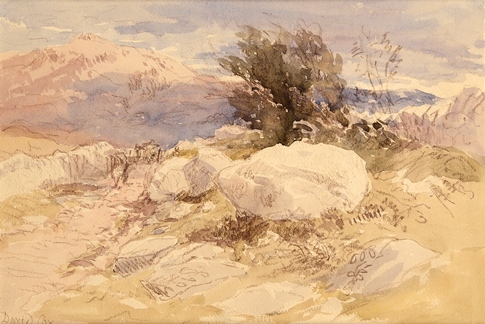 A wash and chalk drawing is in the Ashmolean Museum, Oxford and a watercolour exhibited in the last year of his life is in Worcester City Art Gallery. An oil of the churchyard is in the Graves Art Gallery, Sheffield. The village of Darley Dale lies north of Matlock, Derbyshire, on the banks of the river Derwent. 15.8 by 21.5 cm., 6 ¼ by 8 ½ in. 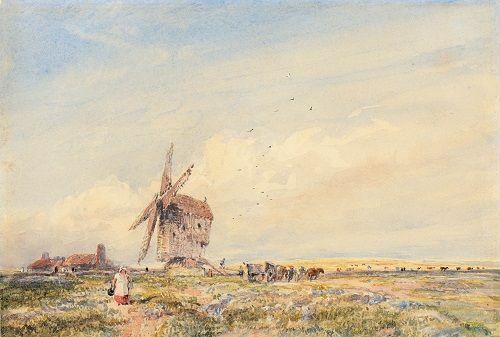 Holbrook Gaskell who owned this watercolour was a Liverpool industrialist and a major collector of British Pictures including works by Constable and Turner. The 1890 exhibition at Birmingham of Cox’s work included 31 works from the Gaskell collection. Much of it was sold at Christie’s in 1909. 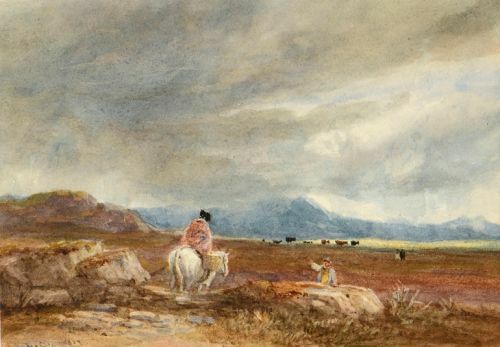 Cox drew a number of watercolours featuring bulls in the early 1850s: ‘Bathers Disturbed by a Bull’ (Whitworth Art Gallery, dated 1853), `Mountain Scene, North Wales, with Bull and Two Youths’ (Harris Museum and Art Gallery, Preston), `On the Moors, near Bettws-y-Coed’ (V & A, depicting a bull in a storm) and `The Challenge’ (Ashmolean Museum, Oxford, 1853). Watercolour over pencil heightened with bodycolour 26.6 by 36.2 cm., 10 1/2 by 14 1/4 in. This drawing, like no.39, dates from the mid 1830s and may relate to Cox’s drawings for Roscoe’s `Wanderings and Excursions in North Wales’ published in 1836. Watercolour over pencil heightened with bodycolour and stopping out 17.3 by 25.6 cm., 6 3/4 by 10 in. This probably belonged to Walter (Tommy) MacGeough-Bond (1908-1986) who had a large art collection. 15 by 22.3 cm., 5 ¾ by 8 ¾ in. Cox only visited the Continent three times, between 1826 and 1832. His first trip in 1826 was to Belgium and Flanders. 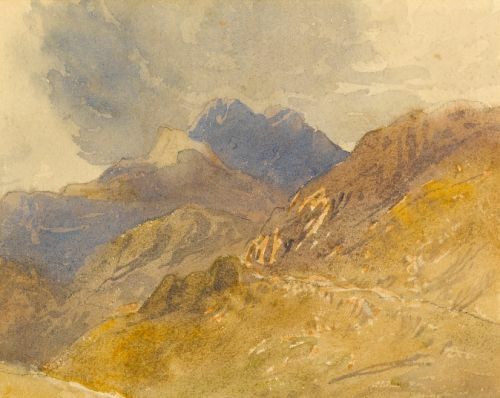 This sketch is likely to date from his 1829 trip which was a six week tour of Northern France. He spent the first week in Calais before visting Amiens, Beauvais and Rouen on route to Paris. The figures in this drawing are wearing dress typical of Normandy. 20.8 by 28.2 cm., 8 by 11 in. 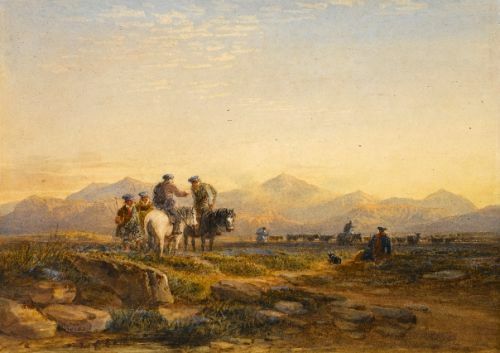 This atmospheric late work is likely to date from the 1850s. 15.8 by 6.6 cm., 6 ¼ by 2 ½ in. 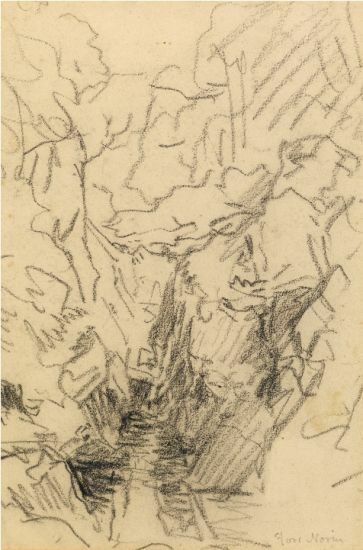 A sketch of the same figure by Cox is in the Fitzwilliam Museum, Cambridge. 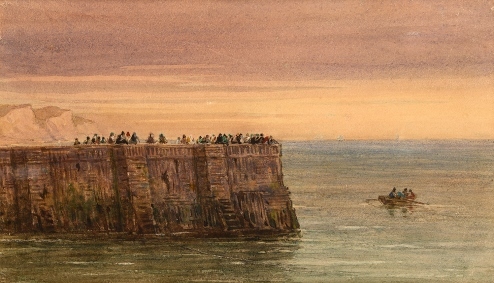 139 x 205 mm., 5 ½ x 8 in. 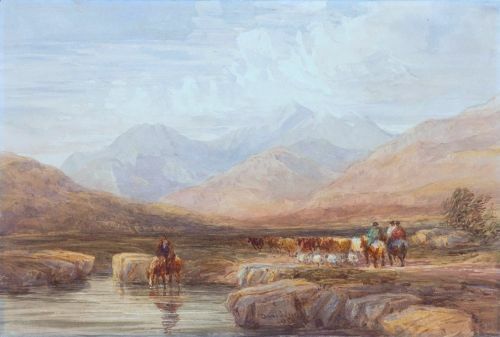 In 1827 Cox returned to London from Hereford where he remained until 1835. 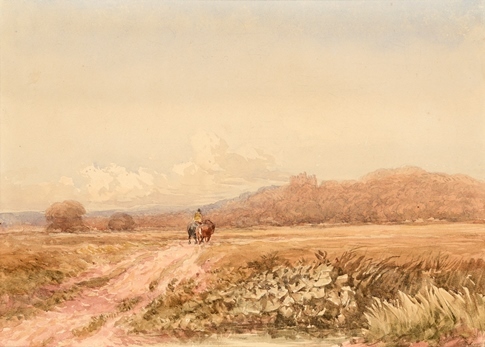 In the early 1830s, Cox began to visit the north of England for the first time with recorded visits to Haddon, Hardwick, Bolsover, Bolton Abbey and Lancaster. 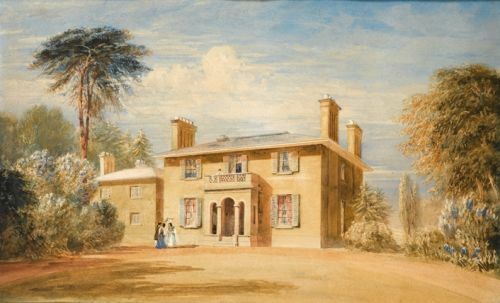 In the summer of 1831, the date of the present work, Cox visited Haddon Hall in Derbyshire, with his son David Cox Junior (see no.45) and made a series of drawings of the house while staying at the Peacock Inn at Rowsley. 214 x 335 mm., 8 ¼ x 13 in. 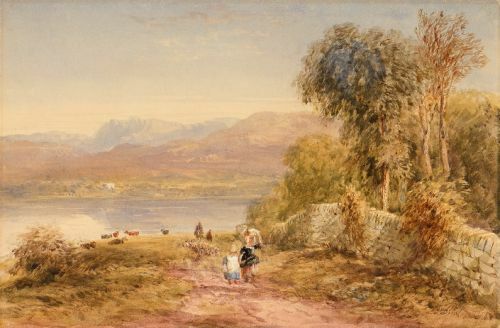 Stylistically this watercolour dates from 1815-20. This early work dates from circa 1815. At around this time, Cox moved from Dulwich, south of London, to Hereford. Pandy Mill is situated on the river Machno near its junction with the river Conway, two miles south-east of Bettws-y-Coed. Cox visited Bettws in 1844 and returned there almost every summer afterwards. The present drawing dates from his visit there in September 1852 according to an inscription on the reverse. The scenery in the surrounding area is especially dramatic. Solly in his biography of Cox described it as follows: ?It is surrounded by rocky glens and deep wooded valleys. . . . Through these the mountain streams, the Machno, the Lledr, and the Llugwy, flow on towards their junction with the Conway. . . . All these streams are spanned by old and picturesque bridges, well known to lovers of art and Welsh scenery, and their banks also adorned by several ancient water-mills; of these, Pandy Mill, on the Machno, is the chief, on account of its romantic situation and the fine old oaks which surround it? (see N. Neal Solly, Memoir of the Life of David Cox, reprinted 1973, p.158-9). 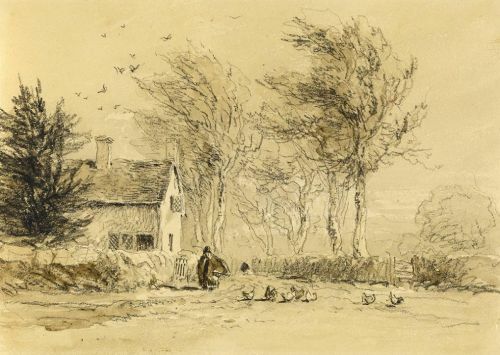 Stylistically this work dates from the 1830s when Cox was living in Hereford and presumably it was drawn as a commission. This is a view of <?xml:namespace prefix = st1 />Westminster taken from the south bank of the Thames near Vauxhall. Stylistically this work dates from the mid 1830s. In October 1834 a fire destroyed the old Houses of Parliament but it is difficult to tell from this angle whether Cox is drawing this view before or after the fire. Westminster Hall which is visible to the right of Westminster Abbey emerged relatively unscathed by the fire. To the left of Westminster Abbey stand the four towers of St. John?s, Smith Square in front. To the right, the other side of Westminster Bridge, is the shot tower which was built in 1826. 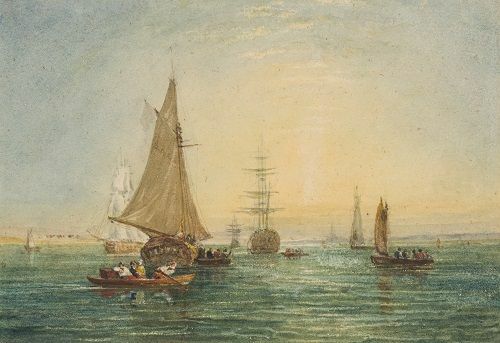 This watercolour dates from the early 1820s. 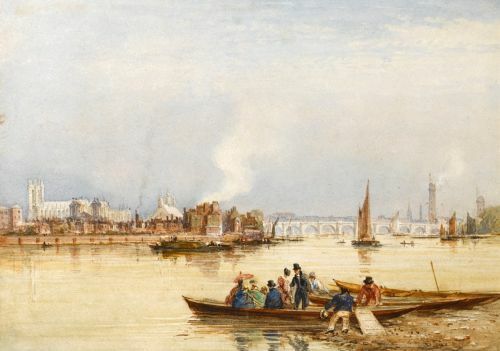 Cox exhibited a number of Thames views in the 1820s and 1830s when he was living in Hereford but returned to live in London from 1827 until 1841. 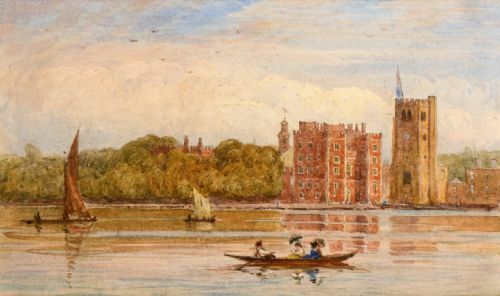 This may be the work exhibited at the Society of Painters in Water-colours in 1824, no.294, `Lambeth Palace from Mill Bank – A sketch’. Lambeth Palace has been the home of the Archbishop of Canterbury since the 13th century. The church of St Mary-at-Lambeth, to the right of the Palace, originally dates from the 1370s but was rebuilt in the late 15th and early 16th centuries. It was badly damaged in the Second World War and is now the Garden Museum. The Tudor Gatehouse to the left of the church was built by Archbishop Morton in 1486-1501 and is still used as the main entrance into the Palace. To its left is the tower of the Great Hall which has been built and rebuilt many times over the years thanks to damage in the Civil War and then in the Blitz. In the late 1820s it was converted into a library by Edward Blore. 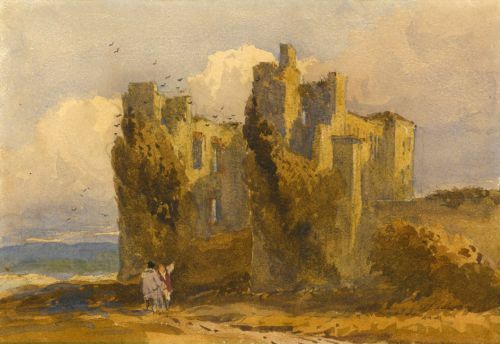 Estate of Edith Hall, U.S.A.
Kenilworth Castle, which stands four miles north of Warwick, was a popular subject for Cox, particularly early in his career. 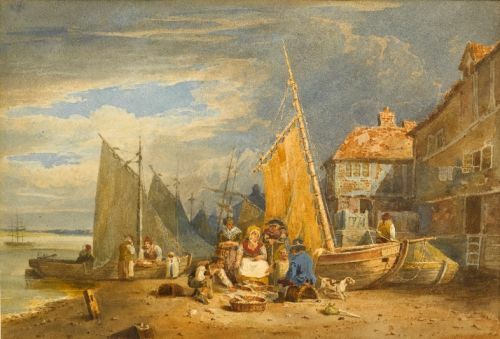 An early view, dated to circa 1807, is in Birmingham Museums and Art Gallery, an 1830 watercolour is in the Lady Lever Art Gallery, Port Sunlight and a late view in Worcester City Museum and Art Gallery (see Scott Wilcox, Sun, Wind, and Rain ? The Art of David Cox, 2008, p.146, no.5 and figs. 94 and 95). 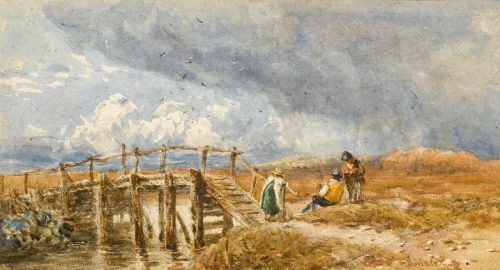 The present watercolour dates from the 1830s. Estate of Edith Hall, <?xml:namespace prefix = st1 />U.S.A. Haddon Hall was one of Cox?s sketching grounds. He seems to have first visited ?delightful old Haddon? in August 1831 as part of one of his summer tours of Derbyshire in the company of his son David Cox Junior and William Roberts, when he would also visit Hardwick Hall and Bolsover Castle. His letter to Roberts of 28th August 1831 reads: ?We have visited the Hall every day since you left. Today we had Mr Severn?s car and went to Chatsworth and round by Bakewell. . . . but I do not expect to be much pleased with anything this country can afford after my favourite old Haddon. Indeed, this alone is quite enough for one summer.? Haddon was the Tudor seat of the Dukes of Rutland but had been supplanted by Belvoir Castle since the 1740s so it was empty at the time (and remained so until 1912) which must have added to its sense of romanticism. 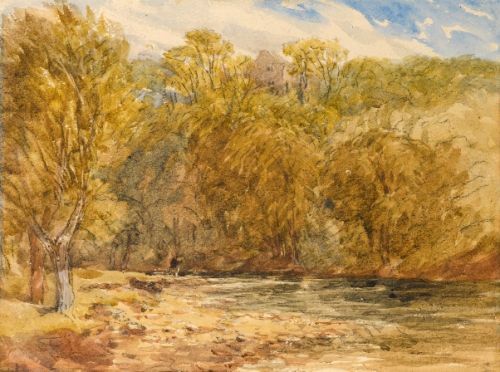 Cox returned frequently to Haddon in the late 1830s and the present watercolour dates from his visit in May 1845 in the company of his friend and patron William Ellis who eventually owned over three hundred works by Cox. The weather was bad but they stayed in the area for two weeks. 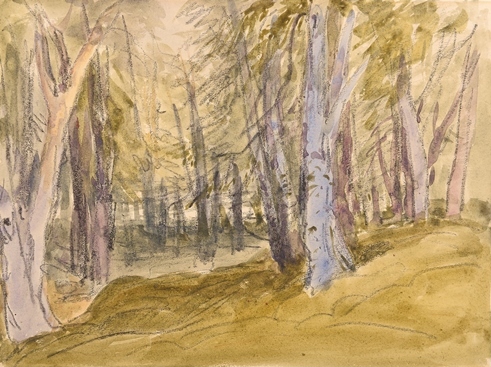 Drawings from this trip were the first of Haddon in Cox?s late, loose style and are often signed with initials and dated, as with the present work. For two more watercolours from this trip, see Air and distance, storm and sunshine ? Paintings, watercolours and drawings by David Cox, exhibition catalogue, Spink-Leger, 1999, nos. 31 and 34. 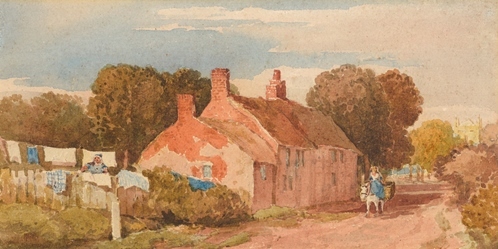 This may be the watercolour of this title exhibited at the Society of Painters in Watercolours in 1829, no.321. Cox exhibited a number of views on the <?xml:namespace prefix = st1 />Thames in the late 1820s. He returned to live in London, from Hereford, in 1827 and remained there until 1841 when he returned to Birmingham. 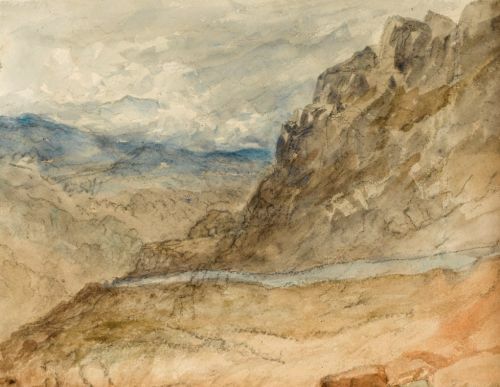 This drawing dates from Cox?s trip to Derbyshire in May 1845 in the company of his friend and patron William Ellis. He frequently visited Haddon Hall from 1831 onwards and the area was a favourite sketching area. He normally stayed at the Peacock Inn at Rowsley. Cox?s friend N.N. 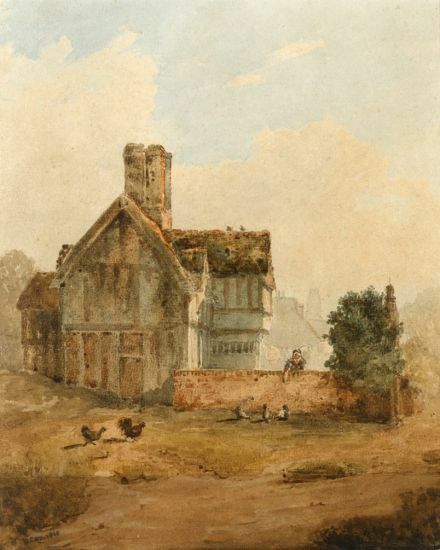 Solly recalls: `These views at Rowsley were generally sketched before breakfast. 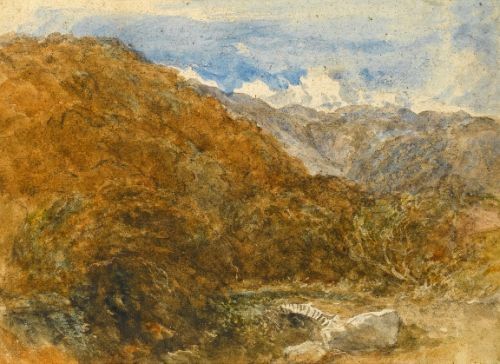 Cox made sometimes two drawings before breakfast, and began a third, and then spent the day afterwards sketching at Haddon Hall; this was in the month of May, 1845, when he was still in his full vigour? (N.Neal Solly, Memoir of the Life of David Cox, 1873, p.269). 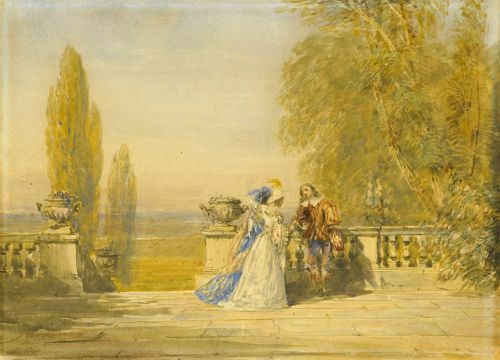 This is one of series of drawings by Cox of figures in seventeenth century costume on a terrace which date from the 1830s. They are sometimes based on the terraces at Haddon Hall or Powis Castle. For another example, see Scott Wilcox, Sun, Wind, and Rain ? The Art of David Cox, 2008, p.187, no.59. Drawings in wash and black chalk of this type by Cox date from the mid 1840s (see Scott Wilcox, Sun, Wind, and Rain ? The Art of David Cox, 2008, p.200?1, nos.74 and 75). 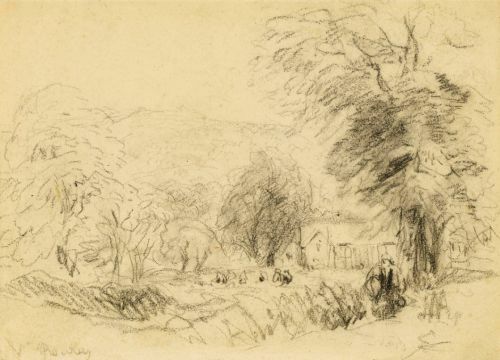 This wonderfully loose but controlled drawing is typical of Cox?s work of the early 1850s when he is at his most confident and impressionistic. He concentrates on his depiction of the sky and especially the passing storm. 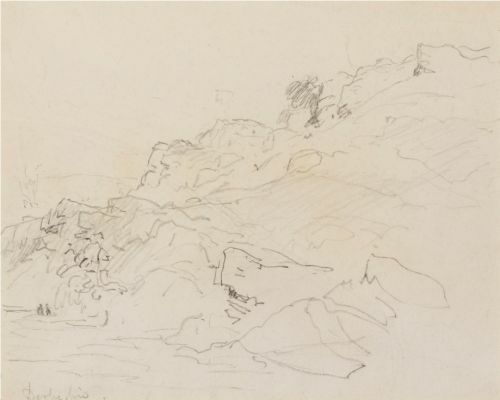 It may be drawn on the same sketchbook sheet as a group of drawings of Rhyll Sands which date from 1854. Cox often used a rough Scotch paper at this period but these are ordinary wove paper which measures the same size as this sheet. 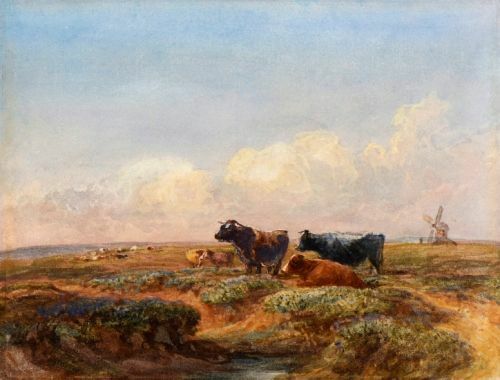 One in the University of Liverpool Art Gallery is signed and dated 1854 (see Andrew Wilton and Annie Lyles, The Great Age of British Watercolours 1750-1850, 1993, no.77, pl.233), another is in the Victoria and Albert Museum and a third was sold at Christie?s on 21st November 2001, lot 47. 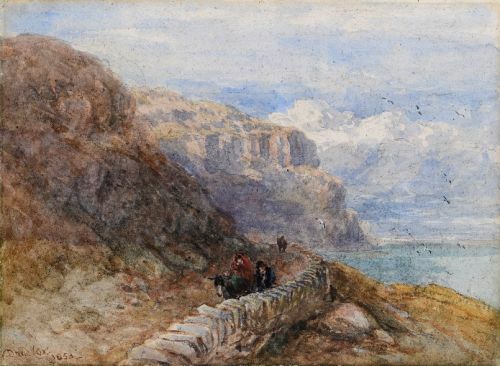 Cox was a regular visitor to North Wales from the mid 1840s and the drawing of Conway Castle on the reverse suggests this could be a view on the North Welsh coast or possibly on the estuary of the river Conway. 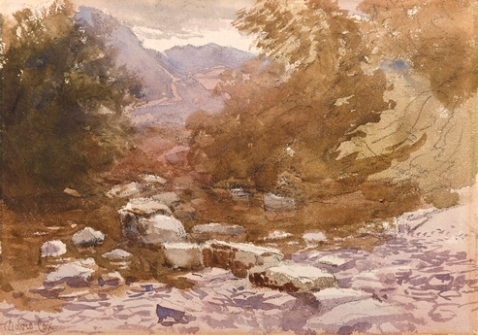 This watercolour, in wonderful condition, is likely to be a view taken at or near Penmaen Mawr on the Welsh coast several miles south-west of Conway. 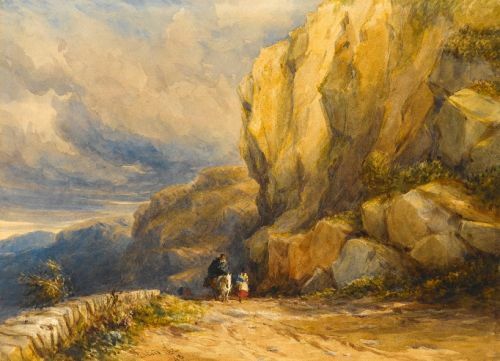 It was a steep cliff top road and a popular subject matter for Cox in the 1840s. From 1842, Cox made an almost yearly trip to North Wales and particularly the area around Bettws-y-Coed. In August of that year, he visited Conway and Betws. 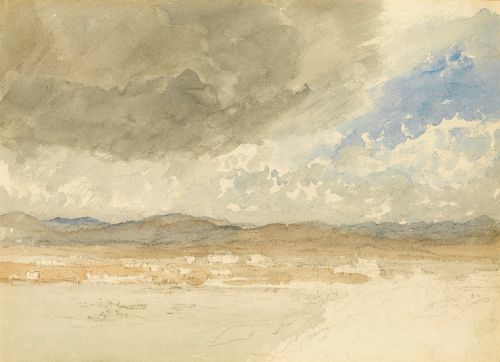 Another watercolour of this same view was with Spink-Leger, London, in 1999 (see `Air and distance, storm and sunshine? ? Paintings, watercolours and drawings by David Cox, exhibition catalogue, 1999, no.27, ill.). This important early watercolour dates from circa 1814/15 after Cox had moved to Hereford to teach at Miss Croucher?s Drawing School. It relates to a more finished version of this view painted in 1815 for Samuel Cane, a Hereford Surgeon, and now in Hereford City Art Gallery. 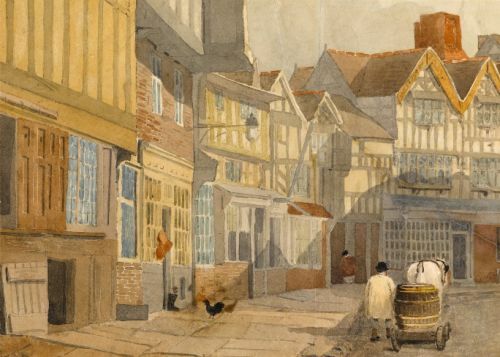 In 1837, Butcher?s Row on Hereford High St was torn down during redevelopment of the city. Only the large twin gabled house on the right house of the picture still remains. 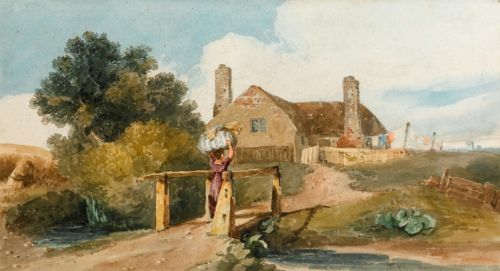 This may have been exhibited at the Society of Painters in Water-colours in 1828, no. 325 as `Scottish Drovers. This early work dates to circa 1810-11. Another version of the same view, with some differences, was with Andrew Wyld in 2006 (see exhibition catalogue, June 2006, no.24). 27 by 36.8 cm., 10 ½ by 14 ½ in. This is a view looking east from the sands of Traeth Mawr near to the village of Prenteg. The peak of Cynicht is shrouded in mist with the twin peaks of Moelwyn Mawr and Moelwyn Bach to the right. 52.3 by 74.9 cm., 20 ¾ by 29 ½ in. This dramatic late work by Cox has been in a private collection since 1946. 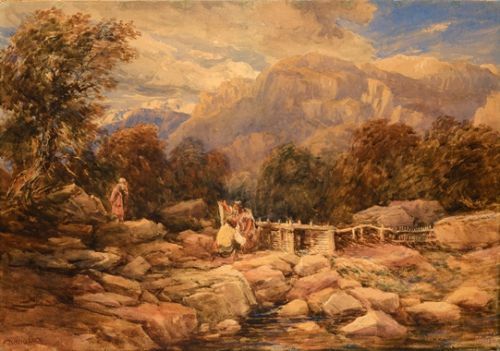 According to the 1890 Cox exhibition catalogue it can be dated to 1850 and is described: `The foreground, rocks and pool of water, with stream rushing from the salmon trap, which occupies centre and right of picture; near the trap, a man holds up a salmon; at the back of him, the figure of a woman; on the left, an old woman approaches the trap; right and left of middle distance, a belt of trees; the hills at Bettws beyond; blue sky, with clouds’ (Wallis and Chamberlain, op. cit.). It is also described in Solly’s 1873 memoir of Cox’s life: `This drawing is on rough paper in the latest style, and was lent to the London International Exhibition in 1872 by F. Pender, Esq., M.P. The scenery is that of Bettws-y-Coed…..the general effect is dark and rather gloomy, although powerful and impressive’ (op. cit.). Cox visited Bettws in 1844 and returned there every summer until 1856. The village stands at the junction of three rivers, the Conway, Lledr and the Llugwy and the scenery in the surrounding area is especially dramatic. 267 x 370 mm., 10 ¾ x14 ¾ in. Bolsover Castle stands on a hill six miles east of Chesterfield overlooking the Vale of Scarsdale. It was built in the early seventeenth century by Sir Charles Cavendish but was in ruins by the mid eighteenth century. It is now in the care of English Heritage. 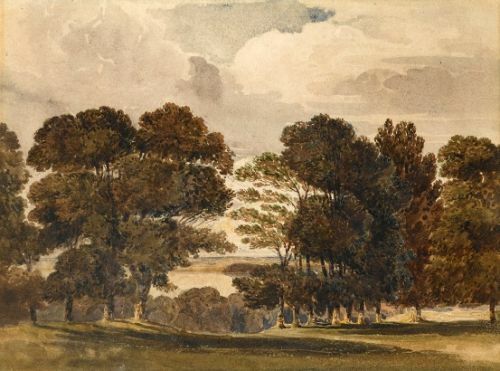 This watercolour dates from the 1830s when Cox was a frequent visitor to Bolsover. He was there in the summer of 1834 and again in September 1835 as well as the summer of 1838. He wrote to a friend William Roberts on 5th September 1835: `…. and on Thursday will start for Bolsover, which I hope to reach by five o’clock. If you have not seen Bolsover, I think you will be pleased with the distant views of it’ (see N. Neil Solly, Memoir of the Life of David Cox, 1873, p.79). 21.9 by 36.5 cm., 8 ¾ by 14 ½ in. In 1799, a competition was held to design a bridge to replace the old London Bridge which was over 600 years old. The completion was won by John Rennie (1761-1821) who planned a bridge of five stone arches. Work began after Rennie’s death in 1824 under the supervision of his son, with the bridge being sited 100 feet upstream of the old bridge which was knocked down after the new bridge opened. Rennie’s bridge was 928 feet long and 49 feet wide. The present watercolour shows the official opening by King William IV and Queen Adelaide on 1st August 1831. The Times described the ceremony as ‘the most splendid spectacle that has been witnessed on the Thames for many years’. This view is taken from the south bank of the Thames, looking towards north towards the tower of the Monument and the church of St. Magnus. The royal standard can be seen flying from the huge pavilion erected at the north end of the bridge where a banquet was held. 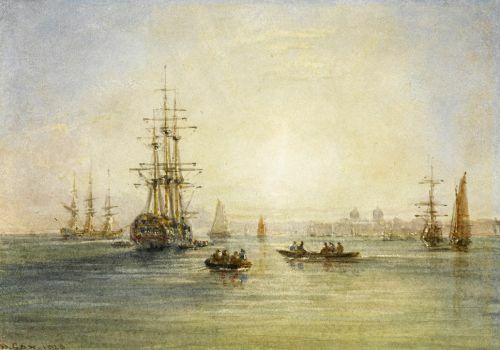 The royal party had embarked at Somerset House and processed to the bridge between a line of boats and barges. The King disembarked at 4pm and walked up red-carpeted stairs to the pavilion. 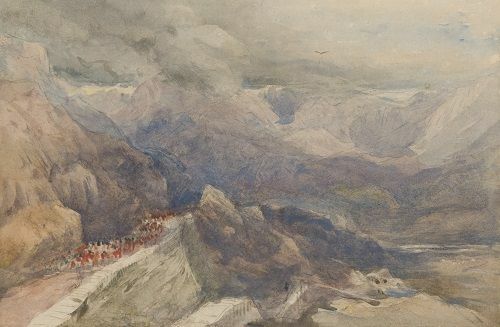 An oil of the subject of Clarkson Stanfield taken from the same viewpoint is in the Royal collection and a finished watercolour by Cox is the Yale Center for British Art. 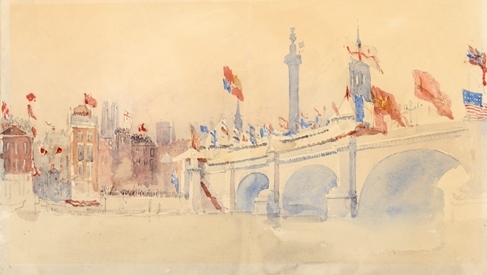 The Yale view omits the flags on the bridge so was probably drawn on the previous day. 17.8 by 26.7 cm., 7 by 10 ½ in. 27.7 by 37.1 cm., 10 ¾ by 14 ½ in. 134 x 232 mm., 5 ¼ x 9 in. This dates from the late 1820s or early 1830s when Cox visited the South Coast a number of times and visited France in 1829 and 1832. 18 by 26 cm., 7 by 10 ¼ in. 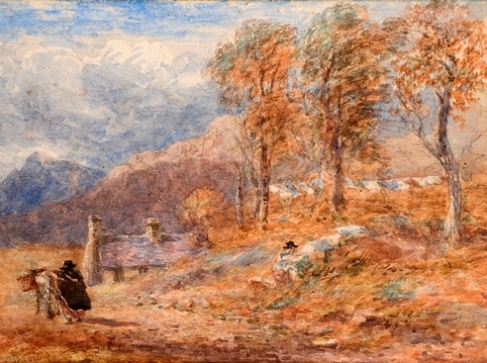 This late work by Cox dates from his annual trip to Bettws-y-Coed in North Wales which took place every summer between 1844 and 1856. In later years he would stay at the Royal Oak Hotel, taking the train from Birmingham to Conway where he would be met by an open carriage. Solly describes the artist’s routine while staying there: `He used to get up at eight to breakfast, and if fine he would go out sketching till dinner, at one o’clock. After dinner, a good rest and a nap, followed by an early cup of tea, quite refreshed him, and he would sally out again to see and take notes of the evening effects, and especially the sunsets, which he never liked to miss. At eight, or sooner, he returned home to a light supper, and then to bed, about nine o’clock’ (see N.N. Solly, Memoir of the Life of David Cox, 1873, pp.178-179). For more on his visits to Bettws-y-Coed, see Stephen Wildman, David Cox 1783-1859), pp.113-124). 13.9 by 27.2 cm., 5 ½ by 10 ½ in. Cox was born in Birmingham and lived there until he moved to London in 1804. 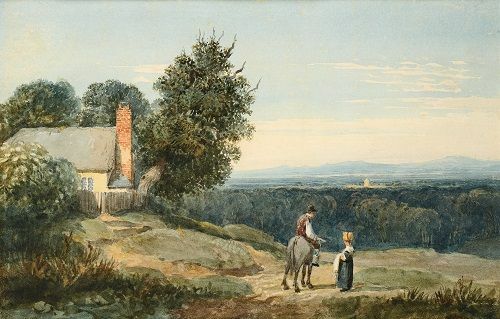 The present watercolour dates stylistically from circa 1815-1820 shortly after his move to Herefordshire. John Marius Wilson’s Imperial Gazetteer of England and Wales describes Moseley as `a village and chapelry in Kings Norton parish, Worcester, The village stands on the N. verge of the county… 3 miles S. of the centre of Birmingham; is a pleasant and picturesque place…’. The building in the distance may be Moseley Hall. Sir George Hill was the Director of the British Museum from 1931 to 1936.